[miau] This unique twist on the popularity of the ninja has nothing to do with slicing fruit, unless of course you are lucky enough to find one of the bonus rounds in the Ninja Fruits Slot game. Play’n Go has created a very compelling and exciting video slot machine game that will provide you hours of fun, especially if you can enter the bonus feature and explode your winnings. This 5 reel and 15 payline video slot game has incredible graphics, including the oriental background that you will see in many of the popular cartoons of this genre. Before you begin making money, you need to understand the variety of different symbols in the Ninja Fruits slot machine. On the low end of the pay table you have five different fruits, the plum, strawberry, orange, pineapple, and the watermelon. The four ninjas are the more powerful paying symbols, ranging in color from yellow, green, blue, and red. The other two symbols in the game are the Sensei and the Geisha, each playing vital roles throughout the game. During regular game play, the Sensei is the wild symbol, substituting for all the other symbols in the Ninja Fruits game except for the Geisha. The Sensei icon will reward you will the jackpot if you can luckily get five of them on any payline. The Geisha symbol triggers a free spin bonus feature if you can get three of them to appear on the reels. What makes the game more exciting is that when the Geisha appears, the games slows down to tease you as the remaining spins continue and reveal whether or not you have in fact found the three geisha symbols. 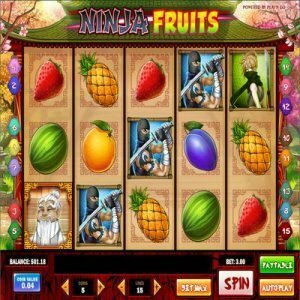 Within the Ninja Fruits game there are two different bonus games that will help grow your bankroll. The first is the Geisha scatter bonus. Three Geisha symbols need to appear on reel 1, 3, and reel 5. Once the free spin bonus is activated, you will be rewarded up to five times your original bet. During the free spin bonus, you are given extra scatters, rewarding you with more free spins dependent on how many are revealed under the umbrella of the Geisha. The next bonus is where the fruit in the Ninja Fruits game really take a beating. To trigger this bonus, you must get a Shuriken symbol on reel 3, 4, and 5. When you enter the Hit A Fruit Bonus, the Sensei and Geisha take their position on opposite sides of five platforms that each have the five different fruits on them. Now it is up to you to select a fruit and let the ninjas take turns throwing the star at them. If they hit the fruit, it reveals a prize, if they miss, the game comes to an abrupt end. Sit back and hit the autoplay button to allow the Ninja Fruits game to simply play out for you. The auto feature will stop when you hit the bonus feature, to allow you to interact with the game and increase your winnings.